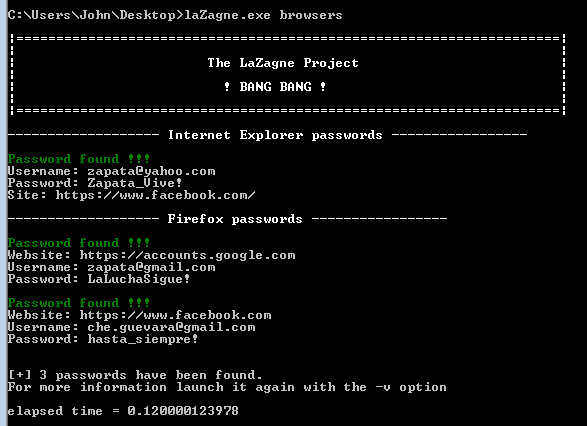 The LaZagne project is an open source application used to retrieve lots of passwords stored on a local computer. Each software stores its passwords using different techniques (plaintext, APIs, custom algorithms, databases, etc.). This tool has been developed for the purpose of finding these passwords for the most commonly-used software. This project has been added to pupy as a post-exploitation module. Python code will be interpreted in memory without touching the disk and it works on Windows and Linux host. The last Linux release is not up to date so I recommend using pupy to use it. Use a file for dictionary attacks (used only when it's necessary: Mozilla Master Password, system hashes, etc.). The file has to be a wordlist in cleartext (no rainbow), it has not been optimized to be fast but could be useful for basic passwords. 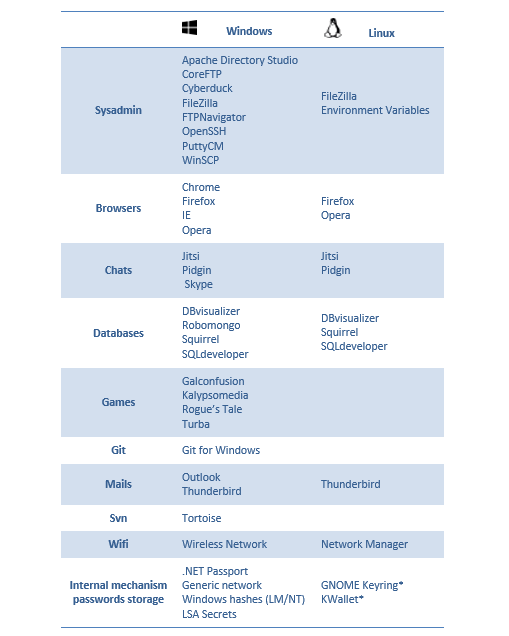 (*) used by many tools to store passwords: Chrome, Owncloud, Evolution, KMail, etc.